Is this drug causing your eczema? If you're among the 10-20% of the population that's suffered from eczema or another form of chronic itch, you know how frustrating this condition can be. No matter what you do, it just won't go away. Eczema, which is characterized by a strong itch sensation, very dry skin, and a bright rash, is currently incurable by conventional medicine. But researchers may have found out why. 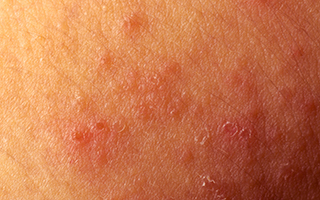 Until now, scientists haven't had much information on what caused eczema. New research published in the online edition of Neuron highlights findings that a serotonin receptor, called HTR7, may play a significant role in eczema and other itchy skin conditions. This is a major breakthrough in the search for relief for itch sufferers. To make this discovery, researchers at the University of California, Berkeley and at the Buck Institute for Research on Aging examined genes from different strains of mice that were suffering from itchy conditions. They honed in on HTR7 because it was very prevalent in the mice with the worst conditions and because they knew that previous studies had linked serotonin signals to eczema in the past. The researchers in this study performed a number of experiments to confirm HTR7's role and found that removing the HTR7 gene altogether caused the mice to scratch less and reduced the severity of their skin lesions. UC Berkeley neuroscientist Diana Bautista reported, "We are really excited about these results. The dramatic decrease in itching suggests that HTR7 may represent a new drug target for chronic itch." The results may also explain why antidepressants, which often raise serotonin levels, can come with itchy side effects. They tested this theory on the mice, giving them the antidepressant Zoloft. The mice demonstrated significant itching symptoms, but when the researchers removed the HTR7 gene, the scratching stopped. In humans, HTR7 is expressed in skin neurons, just like it is in mice, so the researchers believe their findings will be relevant to humans as well. Not only may they contribute to eliminating this uncomfortable side effect of antidepressants, they may help scientists determine how to provide relief to eczema sufferers as well. If you have eczema and take antidepressants, talk to your doctor about treating your depression differently. If your doctor can help you get off of the antidepressant, your eczema might very well improve on its own. In the meantime, one of the best ways to manage eczema and other itchy skin conditions is keeping your skin moisturized with a rich, nutrient-dense, truly natural product, such as the Système 41 Moisturizing Hand & Body Crème.